You are here: Home / Organizing / Family Command Center…Done! As you know from this post, I have been working on creating a family command center in our new kitchen. 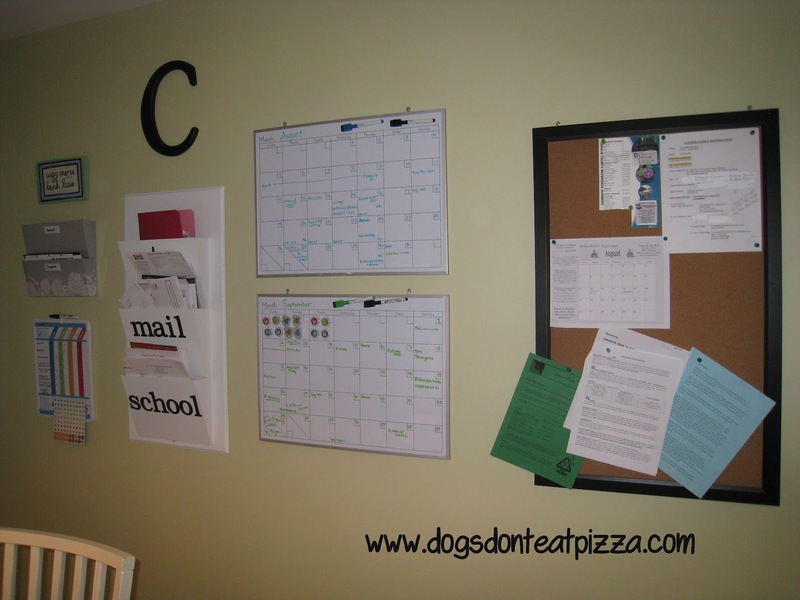 We had a blank wall in our breakfast room and a need for better organization of all of our papers and schedules with school starting. First, I put up a large cork bulletin board. The great thing about this bulletin board is that it covers a very ugly electrical panel, as well as being a place to organize papers. Now that we have a new fridge that I refuse to clutter with papers, we need a place to put important papers we need to see. This is that place. We have our emergency numbers here, my son’s reading calendar, my daughter’s homework list, and some important school papers that require action. Next, I hung two dry-erase magnetic calendars. I put up two calendars so that we can see one month ahead of time, which is so helpful for planning. I got the dry-erase boards at Target for less than $16 each during a back to school sale. I love that they are magnetic; they came with magnets and magnetic clips, for tacking important papers to particular dates (like for field trips or papers with due dates). Next to the calendars is our paper and mail sorter. I bought this at Home Goods several months ago for about $35, and added the letters to it. It’s a great way to corral and sort our papers. I also added a two-pocket sorter for receipts and coupons next to that. We used to put the receipts and coupons in the mail sorter or (worse) piled up on our counter. Now we have a designated place for them. Last, I put up my son’s chores chart. We had put his list of chores upstairs on the bulletin board in his room, but he tended to forget some of them. This way, we have the list right there and it’s a checklist, so he can check off the ones he’s completed. I added some art, because you have to have some fun in all the organizational beauty! I added a wooden letter “C” that I got at a consignment store for $7, and a painted wood sign that says “Wag More, Bark Less.” Amen to that. I am really happy with how this turned out and I already appreciate the added organization and order it provides. For me, order = good. How do you get organized to start the school year? « Mark Your Calendars …Today, I Lost It. Unfortunately, thanks to a diy incident last weekend, I am out of commission for a while! If you want to check out my blog, I have a giveaway going on right now! It’s for a Ramsign enameled metal street number sign. Thanks, Anne! I’ll check it out. And I hope you feel better! Super excited to find your blog! I am in need of a family command board! I am Following too over from ATL fb group! I love your command center Karen! Mine is on my to-do list and is due for an update… I’m definitely going to refer to some of your ideas when I start working on it. Thanks for sharing!